1.2 What to Do in NYC with teens #1: Smalls Jazz Club. 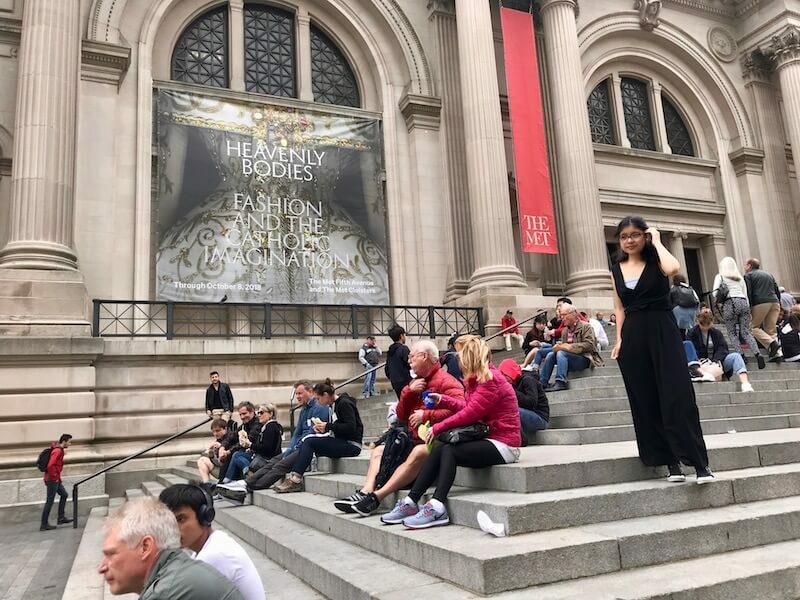 1.4 What to Do in NYC with Teens #2: Metropolitan Museum of Art. 1.11 Where to Eat in NYC with Teens #5: Chinatown! I have been asked by a friend who is bringing his daughter to New York City for a few days this summer as a graduation gift. He expressed to me, what many of us know, that teens these days seem to move from the age of innocence much quicker than our generation. He didn’t want to disappoint her so he asked me to provide him a list of things to do in NYC with a teen daughter, knowing that I had one myself. Though I wrote this list with a father/daughter weekend in mind, I don’t think it’s necessarily gendered specific. 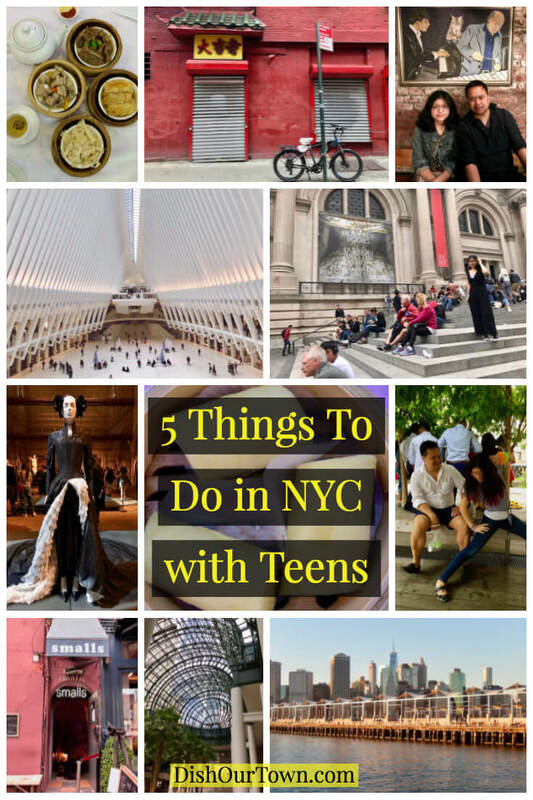 So, if you’re looking for fun things to do in NYC with teens this summer, give this list a try. This list isn’t just for those who plan to visit, but also for the resident who just may need a reminder of what’s out there. I’m aware that our teenage children aren’t quite adults yet, but far gone are days when carving out time for the playground will do. Though it takes a little more effort with a teen, it’s actually a good thing, as our divide in interests gets closer to bridging themselves, which lead to a more fruitful experience. NYC for teens can be a place of revelation, and there is no better place to start than introducing them to slightly different destinations and sites than that of the norm. For the record, it doesn’t need to be done in this order. However, I have tried to pair the site and eatery relatively near each other for the sake of facilitating travel. What to Do in NYC with teens #1: Smalls Jazz Club. Whether either one of you appreciates jazz, I promise all of you will be by the time you walk out. Located in the West Village, this venue located in a basement, is possibly the most intimate music setting in the city. It harkens upon that romantic time when the underground jazz clubs was the coolest place to listen to music. Before catching one of the jazz sessions, a short 7 minute walk away is British Eatery, Tea and Sympathy. Like the club, this place is also small but packed with lots of culture and punch. First and foremost, this place is an eatery, NOT a pub that claims itself to be British or Irish but in reality, just serves burgers and wings. Here you’ll find real English Fare. Try an authentic “fry up” (AKA English Breakfast) replete with traditional blood sausage, fried tomatoes, and beans; along with some bangers and back bacon. Feel real British and order Welsh rarebit with some tea. The waitstaff is British and after a meal here, you’ll want to make London your next destination with your teen. What to Do in NYC with Teens #2: Metropolitan Museum of Art. Give ‘em a bit more culture. This year there is a special exhibit named, “Heavenly Bodies and the Catholic Imagination”. The installation is situated in the beautiful medieval room and interprets how the church has influenced fashion through the modern decades. Viewing outfits designed by the likes of Versace and Dolce and Gabbana can be a lot more fun for a teen rather than be looking at centuries-old paintings. If they follow social media, I bet they can recognize some of the outfits worn by some celebrities. Not just for girls or Catholics, by the way. LOCAL TIP: When visiting, there is an entrance on 81st street (do not go up the front steps) where there are never any lines. There are also a plethora of restrooms on this level that seem to never be used. General admission is$25 for adults; $17 for seniors; $12 for students. If you’re a resident of NY, NJ, CT, admission is up to you, however, make sure to bring ID with your address for proof of residence. A trip to New York wouldn’t be complete if you didn’t get a hot dog and a drink from a street vendor. Some of the best plant themselves right in front of the Met. Don’t go to just any vendor, be sure to support the hot dog stands run by U.S. veterans. Their dogs seem to always be grilled to perfection and they know how to serve (a bit of a pun). Take a seat on the grand stairs of the museum and enjoy those salty encased beef treats with your topping of choice. This no-frills approach allows you and the kids to enjoy the thoroughfare that is as colorful as the art inside. With the fountains on each side, the beautiful architecture of the Museum behind, and Central Park just behind that, there are few seats in the city better. Another LOCAL TIP from a New Yorker, don’t get rid of your tickets, which are in the form of a sticker when you exit. Leave then on as to enter without paying again just in case you may want to use the restroom or see more in the way of the vast art collection after your hot dogs and drinks. 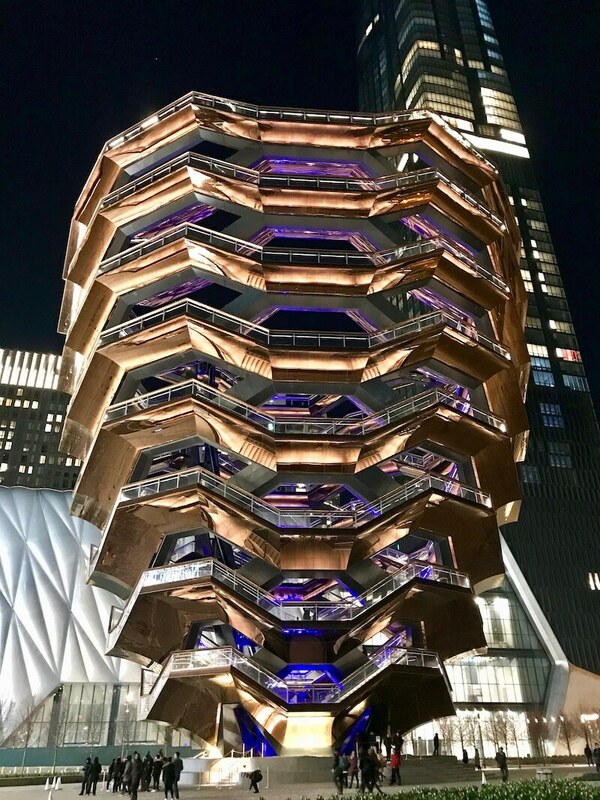 A new addition to the New York landscape is the Hudson Yards. It’s part mall, part food hall, and a destination that can take up most of your day. It’s not a run f the mill mall, this is state of the art with many interactive events happening almost daily. There is also a new site that worth a visit that is within the yards called, the vessel. A structure that is an architectural marvel. It’s just enough culture and tons of leisure for a kid to enjoy, especially if they like to just hang out in a nice environment. Best way to get there is to take the high line all the way to the north end and you’ll be led right to it. A great addition to our still ever growing city. Take a walk on the High Line. Approximately a mile and a half long, this elevated green trail that was once an abandoned railway, makes for a great way to walk the west side of Manhattan without being impeded by car traffic and where you can get some of the best views of the lower Hudson. What they have done with what was once an eyesore ready to be taken down, is nothing short of magnificent. This summer, there is no shortage of activities in which to take advantage. For example, there are Latin dance parties in the evening that will make the teens feel like they’re out for the night. On the street level near the 16th street stairs entrance to the High Line, is the Chelsea Market. Teens love this place. There are endless shops and eateries in this famous indoor market. If you want to take the lead and narrow choices a bit when it comes to eating, try the Lobster Place. The energy in this eatery is unequaled. It’s a great place to have seafood favorites such as lobster, but there are other options which include endless chowders/bisques and sandwiches. However, It’s the raw bar and the sushi bar that make for the best experience. Carve out a space for yourselves and order as much or as little as you’d like. One can order a piece of sushi or mollusk at a time if new to the raw game. Walk over the Brooklyn Bridge. It’s always a good idea to keep teens moving. If you give them the chance, they’ll be on those damn phones all day. The walk over the Brooklyn Bridge is not only a quintessential New York experience, but it is also an architectural structure to behold; and what better way to appreciate it than actually being on it? It makes for great photo ops and helps get the appetite up before reaching the landing on the other side. Also, I’m sure every teen would want to experience the borough that has recently been considered the epitome of cool. When you get to the Brooklyn side of the bridge, the pedestrian path will split in two. Take the left-hand path and take a short flight of stairs down to Washington Street. This is a great place to start your Brooklyn experience. 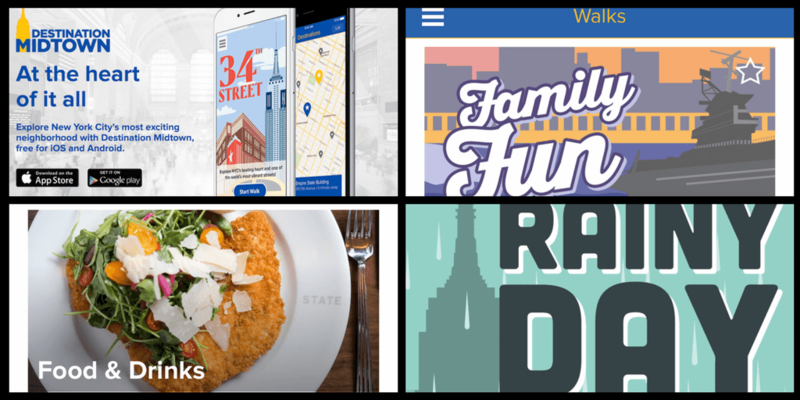 Since you’ve gotten yourselves to another borough, I will list a few places to eat rather than just one. Introduce the teen(s) to the famous Brooklyn cafe culture and start the day with a visit the very local Brooklyn Roasting Company. It’s a hipster enclave, but not overbearing for we adults. After a long day, a walk back may be too much to ask. Take the Ferry back to Manhattan, which docks at the same landing where Brooklyn Ice Cream Factory is located. Take it in the early evening, it’s a wonderful ride. Adults will love this place because it’s a free site. Teens will love it because it’s not only a wonder to behold, but it is also a Westfield Mall. Walk all the way through this structure which starts on the East side of lower Manhattan, all the way to the end where it connects to The Brookfield Mall. Also known as the World Financial Center (a beautiful structure in its own right) this mall, marks that you have arrived on the West Side of Manhattan. From here, walk out into the esplanade and experience the southern part of the magnificent Hudson River. Walk around this neighborhood known as Battery Park City and view New Jersey just across the way. A short stroll south, Ellis Island and The Statue of Liberty start coming into view. This combination makes for a great indoor/outdoor day. Where to Eat in NYC with Teens #5: Chinatown! Walk through the Oculus again and bring yourselves back to the East side. About a 10-15 minute walk Northeast from the here will bring you to the heart of Chinatown. No teen should leave New York without trying some authentic Chinese Food (meaning, not the General Tsao Chicken variety). Bring them to a down-home place, where the waiters can be a bit abrupt (part of the experience). For Dim Sum, eat where the locals go and avoid any place where the oriental/occidental ratio seems close. Locals go to Royal Seafood 103 Mott St New York, NY 10013 (212) 219-2338 versus a place like Golden Unicorn 18 EAST BROADWAY, NEW YORK, NY 10002 TEL: (212) 941-0911. Upon entering, go to the guy with the microphone and tell him how many in your party and he will hand you a number. Numbers are announced in Cantonese, so be sure to tell him to say yours in English. Once seated, you’ll be given a ticket which you’ll hand the ladies with the food carts to stamp every time you order a dish. Be sure to ask them to open the little steam baskets, so you can view the choices. Sometimes, they just say in Chinese what they have in their cart. Dim Sum is only available during the morning and early part of the afternoon, so if you want regular fare, a place we recommend is HK Wonton Garden 79 Mulberry St, New York, NY 10013. After a visit to this humble eatery, you’ll understand how a wonton soup is supposed to really taste. Both eateries are true cultural experiences which will make the teens feel like they have been made part of one of the beautiful subcultures that make New York a wonderful melting pot. It also happens to be one of the most fun things to do in NYC with teens. Hope this list helps and see you and your teen(s) in New York this summer. Great Accommodations for NYC: Best Hotels in NYC. Dish Our Town generates income through partnerships with travel and food-related brands. Any purchases made through our site via their links will be of no extra cost to you. For more information, go to our disclaimer. Pin it to your favorite travel boards!